Atom interferometry has become one of the most powerful technologies for precision measurements. To develop simple, precise, and versatile atom interferometers for inertial sensing, we demonstrate an atom interferometer measuring acceleration, rotation, and inclination by pointing Raman beams toward individual faces of a pyramidal mirror. Only a single-diode laser is used for all functions, including atom trapping, interferometry, and detection. Efficient Doppler-sensitive Raman transitions are achieved without velocity selecting the atom sample, and with zero differential AC Stark shift between the cesium hyperfine ground states, increasing signal-to-noise and suppressing systematic effects. We measure gravity along two axes (vertical and 45° to the vertical), rotation, and inclination with sensitivities of 6 μm/s2/Hz, 300 μrad/s/Hz, and 4 μrad/Hz, respectively. This work paves the way toward deployable multiaxis atom interferometers for geodesy, geology, or inertial navigation. A. Peters, K. Y. Chung, and S. Chu, “High-precision gravity measurements using atom interferometry,” Metrologia 38, 25–61 (2001). H. Müller, S.-W. Chiow, S. Herrmann, S. Chu, and K.-Y. Chung, “Atom-interferometry tests of the isotropy of post-Newtonian gravity,” Phys. Rev. Lett. 100, 031101 (2008). Z.-K. Hu, B.-L. Sun, X.-C. Duan, M.-K. Zhou, L.-L. Chen, S. Zhan, Q.-Z. Zhang, and J. Luo, “Demonstration of an ultrahigh-sensitivity atom-interferometry absolute gravimeter,” Phys. Rev. A 88, 043610 (2013). G. Rosi, L. Cacciapuoti, F. Sorrentino, M. Menchetti, M. Prevedelli, and G. M. Tino, “Measurement of the gravity-field curvature by atom interferometry,” Phys. Rev. Lett. 114, 013001 (2015). P. Asenbaum, C. Overstreet, T. Kovachy, D. D. Brown, J. M. Hogan, and M. Kasevich, “Phase shift in an atom interferometer due to spacetime curvature across its wave function,” Phys. Rev. Lett. 118, 183602 (2017). I. Dutta, D. Savoie, B. Fang, B. Venon, C. L. Garrido Alzar, R. Geiger, and A. Landragin, “Continuous cold-atom inertial sensor with 1 nrad/sec rotation stability,” Phys. Rev. Lett. 116, 183003 (2016). J. B. Fixler, G. T. Foster, J. M. McGuirk, and M. A. Kasevich, “Atom interferometer measurement of the Newtonian constant of gravity,” Science 315, 74–77 (2007). S.-Y. Lan, P.-C. Kuan, B. Estey, D. English, J. M. Brown, M. A. Hohensee, and H. Müller, “A clock directly linking time to a particle’s mass,” Science 339, 554–557 (2013). R. Bouchendira, P. Cladé, S. Guellati-Khélifa, F. Nez, and F. Biraben, “New determination of the fine structure constant and test of the quantum electrodynamics,” Phys. Rev. Lett. 106, 080801 (2011). R. H. Parker, C. Yu, B. Estey, W. Zhong, E. Huang, and H. Müller, “Controlling the multiport nature of Bragg diffraction in atom interferometry,” Phys. Rev. A 94, 053618 (2016). L. Zhou, S. Long, B. Tang, X. Chen, F. Gao, W. Peng, W. Duan, J. Zhong, Z. Xiong, J. Wang, Y. Zhang, and M. Zhan, “Test of equivalence principle at 10−8 level by dual-species double-diffraction Raman atom interferometer,” Phys. Rev. Lett. 115, 013004 (2015). J. Hartwing, S. Abend, C. Schubert, D. Schlippert, H. Ahlers, K. Posso-Trujillo, N. Gaaloul, W. Ertmer, and E. M. Rasel, “Testing the universality of free fall with rubidium and ytterbium in a very large baseline atom interferometer,” New J. Phys. 17, 035001 (2015). X.-C. Duan, X.-B. Deng, M.-K. Zhou, K. Zhang, W.-J. Xu, F. Xiong, Y.-Y. Xu, C.-G. Shaom, J. Luo, and Z.-K. Hu, “Test of the universality of free fall with atoms in different spin orientations,” Phys. Rev. Lett. 117, 023001 (2016). P. Hamilton, M. Jaffe, P. Haslinger, Q. Simmons, H. Müller, and J. Khoury, “Atom-interferometry constraints on dark energy,” Science 349, 849–851 (2015). M. Jaffe, P. Haslinger, V. Xu, P. Hamilton, A. Upadhye, B. Elder, J. Khoury, and H. Müller, “Testing sub-gravitational forces on atoms from a miniature in-vacuum source mass,” Nat. Phys. 13, 938–942 (2017). T. Kovachy, P. Asenbaum, C. Overstreet, C. A. Donnelly, S. M. Dickerson, A. Sugarbaker, J. M. Hogan, and M. A. Kasevich, “Quantum superposition at the half-meter scale,” Nature 528, 530–533 (2015). N. Yu and M. Tinto, “Gravitational wave detection with single-laser atom interferometers,” Gen. Relativ. Gravit. 43, 1943–1952 (2011). P. W. Graham, J. M. Hogan, M. A. Kasevich, and S. Rajendran, “New method for gravitational wave detection with atomic sensors,” Phys. Rev. Lett. 110, 171102 (2013). J. Harms, B. J. J. Slagmolen, R. X. Adhikari, M. C. Miller, M. Evans, Y. Chen, H. Müller, and M. Ando, “Low-frequency terrestrial gravitational-wave detectors,” Phys. Rev. D 88, 122003 (2013). C. Freier, M. Hauth, V. Schkolnik, B. Leykauf, M. Schilling, H. Wziontek, H.-G. Scherneck, J. Müller, and A. Peters, “Mobile quantum gravity sensor with unprecedented stability,” J. Phys. Conf. Ser. 723, 012050 (2016). B. Fang, I. Dutta, P. Gillot, D. Savoie, J. Lautier, B. Cheng, C. L. Garrido Alzar, R. Geiger, S. Merlet, F. Pereira Dos Santos, and A. Landragin, “Metrology with atom interferometry: inertial sensors from laboratory to field applications,” J. Phys. Conf. Ser. 723, 012049 (2016). R. Geiger, V. Ménoret, G. Stern, N. Zahzam, P. Cheinet, B. Battelier, A. Villing, F. Moron, M. Lours, Y. Bidel, A. Bresson, A. Landragin, and P. Bouyer, “Detecting inertial effects with airborne matter-wave interferometry,” Nat. Commun. 2, 474 (2011). B. Barrett, L. Antoni-Micollier, L. Chichet, B. Battelier, T. Lévèque, A. Landragin, and P. Bouyer, “Dual-matter-wave inertial sensors in weightlessness,” Nat. Commun. 7, 13786 (2016). B. Canuel, F. Leduc, D. Holleville, A. Gauguet, J. Fils, A. Virdis, A. Clairon, N. Dimarcq, C. J. Bordé, A. Landragin, and P. Bouyer, “Six-axis inertial sensor using cold-atom interferometry,” Phys. Rev. Lett. 97, 010402 (2006). S. M. Dickerson, J. M. Hogan, A. Sugarbaker, D. M. S. Johnson, and M. A. Kasevich, “Multiaxis inertial sensing with long-time point source atom interferometry,” Phys. Rev. Lett. 111, 083001 (2013). K. S. Hardman, P. J. Everitt, G. D. McDonald, P. Manju, P. B. Wigley, M. A. Sooriyabandara, C. C. N. Kuhn, J. E. Debs, J. D. Close, and N. P. Robins, “Simultaneous precision gravimetry and magnetic gradiometry with a Bose-Einstein condensate: a high precision, quantum sensor,” Phys. Rev. Lett. 117, 138501 (2016). A. V. Rakholia, H. J. McGuinness, and G. W. Biedermann, “Dual-axis high-data-rate atom interferometer via cold ensemble exchange,” Phys. Rev. Appl. 2, 054012 (2014). Q. Bodart, S. Merlet, N. Malossi, F. Pereira Dos Santos, P. Bouyer, and A. Landragin, “A cold atom pyramidal gravimeter with a single laser beam,” Appl. Phys. Lett. 96, 134101 (2010). D. L. Butts, J. M. Kinast, B. P. Timmons, and R. E. Stoner, “Light pulse atom interferometry at short interrogation times,” J. Opt. Soc. Am. B 28, 416–421 (2011). M. Andia, R. Jannin, F. Nez, F. Biraden, S. Guellati-Khélifa, and P. Cladé, “Compact atomic gravimeter based on a pulsed and accelerated optical lattice,” Phys. Rev. A 88, 031605 (2013). P. Hamilton, M. Jaffe, J. M. Brown, L. Maisenbacher, B. Estey, and H. Müller, “Atom interferometry in an optical cavity,” Phys. Rev. Lett. 114, 100405 (2015). G. W. Biedermann, H. J. McGuinness, A. V. Rakholia, Y.-Y. Jan, D. R. Wheeler, J. D. Sterk, and G. R. Burns, “Atom interferometry in a warm vapor,” Phys. Rev. Lett. 118, 163601 (2017). S. Abend, M. Gebbe, M. Gersemann, H. Ahlers, H. Müntinga, E. Giese, N. Gaaloul, C. Schubert, C. Lämmerzahl, W. Ertmer, W. P. Schleich, and E. M. Rasel, “Atom-chip fountain gravimeter,” Phys. Rev. Lett. 117, 203003 (2016). C. Diboune, N. Zahzam, Y. Bidel, M. Cadoret, and A. Bresson, “Multi-line fiber laser system for cesium and rubidium atom interferometry,” Opt. Express 25, 16898–16906 (2017). A. N. Dinkelaker, M. Schiemangk, V. Schkolnik, A. Kenyon, K. Lampmann, A. Wenzlawski, P. Windpassinger, O. Hellmig, T. Wendrich, E. M. Rasel, M. Giunta, C. Deutsch, C. Kürbis, R. Smol, A. Wicht, M. Krutzik, and A. Peters, “Autonomous frequency stabilization of two extended-cavity diode lasers at the potassium wavelength on a sounding rocket,” Appl. Opt. 56, 1388–1396 (2017). K. I. Lee, J. A. Kim, H. R. Noh, and W. Jhe, “Single-beam atom trap in a pyramidal and conical hollow mirror,” Opt. Lett. 21, 1177–1179 (1996). S. Pollock, J. P. Cotter, A. Laliotis, F. Ramirez-Martinez, and E. A. Hinds, “Characteristics of integrated magneto-optical traps for atom chips,” New J. Phys. 13, 043029 (2011). G. W. Biedermann, X. Wu, L. Deslauriers, K. Takase, and M. A. Kasevich, “Low-noise simultaneous fluorescence detection of two atomic states,” Opt. Lett. 34, 347–349 (2009). D. A. Steck, “Cesium D line data,” http://steck.us/alkalidata/cesiumnumbers.1.6.pdf . M.-K. Zhou, X. Xiong, L.-L. Chen, J.-F. Cui, X.-C. Duan, and Z.-K. Hu, “Note: A three-dimension active vibration isolator for precision atom gravimeters,” Rev. Sci. Instrum. 86, 046108 (2015). H. Ahlers, H. Müntinga, A. Wenzlawski, M. Krutzik, G. Tackmann, S. Abend, N. Gaaloul, E. Giese, A. Roura, R. Kuhl, C. Lämmerzahl, A. Peters, P. Windpassinger, K. Sengstock, W. P. Schleich, W. Ertmer, and E. M. Rasel, “Double Bragg interferometry,” Phys. Rev. Lett. 116, 173601 (2016). M. Cadoret, N. Zahzam, Y. Bidel, C. Diboune, A. Bonnin, F. Théron, and A. Bresson, “Phase shift formulation for N-light-pulse atom interferometers: application to inertial sensing,” J. Opt. Soc. Am. B 33, 1777–1788 (2016). A. Bonnin, C. Diboune, N. Zahazm, Y. Bidel, M. Cadoret, and A. Bresson, “New concepts of inertial measurements with multi-species atom interferometry,” arXiv:1710.06289 (2017). M. Vangeleyn, P. F. Griffin, E. Riis, and A. S. Arnold, “Laser cooling with a single laser beam and a planar diffractor,” Opt. Lett. 35, 3453–3455 (2010). 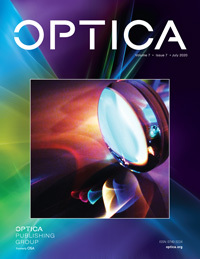 C. Nshii, M. Vangeleyn, J. P. Cotter, P. F. Griffin, E. A. Hinds, C. N. Ironside, P. See, A. G. Sinclair, E. Riis, and A. S. Arnold, “A surface-patterned chip as a strong source of ultracold atoms for quantum technologies,” Nat. Nanotechnol. 8, 321–324 (2013). J. P. McGilligan, P. F. Griffin, R. Elvin, S. J. Ingleby, E. Riis, and A. S. Arnold, “Grating chips for quantum technologies,” Sci. Rep. 7, 834 (2017). M. Vangeleyn, P. F. Griffin, E. Riis, and A. S. Arnold, “Single-laser, one beam, tetrahedral magneto-optical trap,” Opt. Express 17, 13601–13608 (2009). Fig. 1. (a) Multiaxis AIs in a pyramid. A cold atom cloud is trapped inside a pyramidal mirror with a top angle of 90°. Five pairs of the retro-reflected Raman beams are formed, one along the vertical axis and the other four perpendicular to the pyramidal faces. The two angled Raman pairs in the y-z plane are not shown. The angled Raman beams are approximately 45° to the gravity axis. (b) Space-time trajectories of atoms in the Mach–Zehnder geometry and (c) in the butterfly geometry. A matter wave (blue and orange curves) is coherently split, redirected, and combined by momentum transfer from laser pulses (green waves). Fig. 2. (a) Laser system. AOM, acousto-optic modulator; EOM, fiber-based electro-optical modulator. A distributed Bragg reflector diode laser is frequency stabilized by polarization spectroscopy. The frequency detuning of the laser is controlled by AOM 1. AOM 2 works as a fast switch and AOM 3 controls the laser intensity to the EOM. The vertical beam is toward the entire pyramid, and the angled beams are toward individual pyramidal faces. The pushing beam is for spatially separating atoms in the two ground states. (b) Timing sequences of single-laser atom interferometry. Both the cooling beam and the blow-way beam are generated by the undeflected laser of AOM 3. Both the repumping beam and the Raman beam are generated by the EOM. Fig. 3. (a) Energy level scheme of cesium D2 line. The Raman pairs are formed by the carrier ν1 and the first-order sidebands ν2, ν3 from the EOM. (b) Rabi frequency Ωeff, AC Stark shift ΩAC, and single-photon scattering Rsc as functions of single-photon detuning Δ. The Rabi frequency and AC Stark shift are measured by driving two-photon transitions. The measurement uses atoms inside the pyramid, where they see reflections from the four pyramidal faces. This increases ΩAC and Rsc but not Ωeff. The scattering rate Rsc3 is measured as the number of atoms that are transferred from F=3 to F=4 when the Raman detuning is off the two-photon resonance. Each point is a single experimental shot and the curves are the theory predictions. Fig. 4. Acceleration-sensitive fringes of Mach–Zehnder AIs. The vertical AI has a sequence time of 2T=80 ms. The angled AIs have a sequence time of 2T=40 ms. Each point is the average by 10 experimental shots. The curves are sinusoidal fits. Fig. 5. (a) Allan deviation of the vertical AI corrected from Earth’s tides. The dashed line shows the 1/Hz scaling. (b) Tide gravity variation. It was measured from August 7, 2017 to August 10, 2017 by the vertical AI, compared with a tidal model. Each data point is averaged for about 30 min. Fig. 6. Relative projected gravity measured by one of the angled AIs. Each data point is from one fringe, which consists of 11 shots. The orange curve shows the tilt measured by a commercial sensor. Fig. 7. (a) Rotation-sensitive fringes of a butterfly AI along the angled axis. The two fringes are obtained with opposite effective wave vectors. The sequence time is 2T=40 ms. Each point is the average by 10 experimental shots. The curves are sinusoidal fits. (b) Allan deviation of the gyroscope sensitivity. The dashed line shows the 1/N scaling, where N is the averaging fringe number.